La Liberté éclairant le monde | What happened in…. Important and cool events over time…. The Statue of Liberty (Liberty Enlightening the World; French: La Liberté éclairant le monde) is a colossal neoclassical sculpture on Liberty Island in the middle of New York Harbor, in Manhattan, New York City. The statue, designed by Frédéric Auguste Bartholdi and dedicated on October 28, 1886, was a gift to the United States from the people of France. The statue is of a robed female figure representing Libertas, the Roman goddess of freedom, who bears a torch and a tabula ansata (a tablet evoking the law) upon which is inscribed the date of the American Declaration of Independence, July 4, 1776. A broken chain lies at her feet. 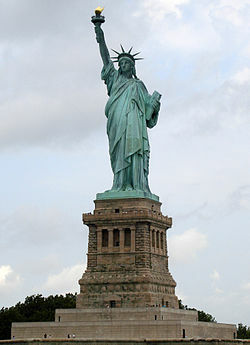 The statue is an icon of freedom and of the United States: a welcoming signal to immigrants arriving from abroad.